OK, class, put your books away and take out a pencil. Spread your chairs out because we're going to have a quiz today. A collective sigh permeates the room. Remember those days? I still have nightmares over those moments, and they were decades ago for me. 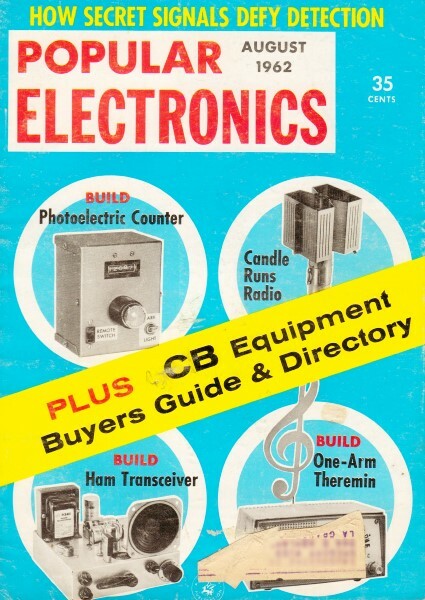 At least this "Electronic Noise Quiz" from the August 1962 edition of Popular Electronics won't affect your GPA. Sometimes PE's quiz illustrations are kind of hard to interpret, but this one does a pretty good job (except item 'E', but I'm not telling what it is since nobody helped me). You will need a fairly diverse background in consumer type electronics to do well, and having a few gray hairs will probably help as well. Good luck. BTW, my score was 80%. The noises that electrical and electronic devices make can indicate normal operation or trouble, and a clever technician trains his ear to distinguish one from the other. 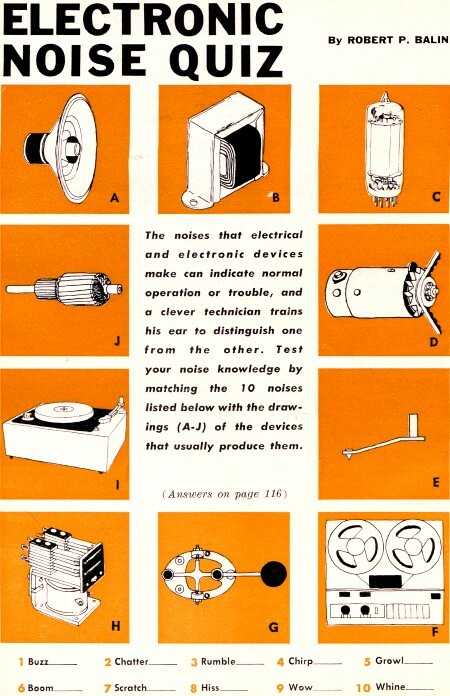 Test your noise knowledge by matching the 10 noises listed below with the drawings (A-J) of the devices that usually produce them. 1 - B) Transformer buzz is usually produced by the vibration of loose laminations in the transformer's iron core. 2 - H) Relay chatter occurs when the current value in the relay coil is somewhere between the normal operating value and the drop-out value. 3 - I) Turntable rumble is a low-frequency vibration mechanically transmitted to the phono cartridge pickup by the turntable drive mechanism. 4 - G) Keying chirp is caused by undesirable variations in transmitted frequency when the transmitter r.f. oscillator is keyed. 5 - J) Armature growl is a symptomatic sound made by an armature containing shorted turns when placed on a test-stand device called a "growler." 6 - A) Loudspeaker boom is produced by self-oscillation of the speaker at a low-frequency resonant point. 7 - E) Needle scratch is due to a worn stylus point. Dirt and dust on a record or a defective record can produce the same sound. 8 - C) Tube hiss is due to electron collisions in an irregular electron stream caused by an uneven cathode coating. 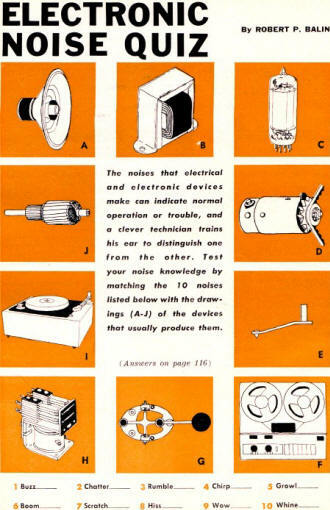 Although a tape recorder (F) and a car generator (D) will also produce hiss, they are not the correct answers for question 8, but for 9 and 10 which follow. 9 - F) Tape recorder wow is comprised of slow variations in the pitch of recorded sounds caused by irregular slippage or drag in the tape drive mechanism. A turntable (I) with a friction drive will also produce wow sounds, but (I) has already been matched with question 3. 10 - D) Generator whine is due to commutator sparking and changes in frequency with varying engine speeds, and it sometimes interferes with reception in or from mobile stations.